One of the bands from the Cramps label, Arti & Mestieri from Turin were formed around 1974 by ex-Trip drummer Furio Chirico (he had previously played with I Ragazzi del Sole and Martò e i Judas) with other musicians from various musical experiences. Venegoni, Vigliar and Vitale had previously played with Il Sogno di Archimede, a jazzy-prog group. Often playing with Area, they shared with them the same interest in fusing jazz-rock with prog elements, and their first album, Tilt, is a very good result, even if the limited vocal parts were their weakest point. The album includes only two vocal tracks, and the rest is mainly instrumental. The group had a good live activity, supporting the likes of PFM and even Gentle Giant, as demonstrated by the good and now deleted Live CD released in 1990 (another live CD with a different 1974 recording has been released in 2002, see below for details). 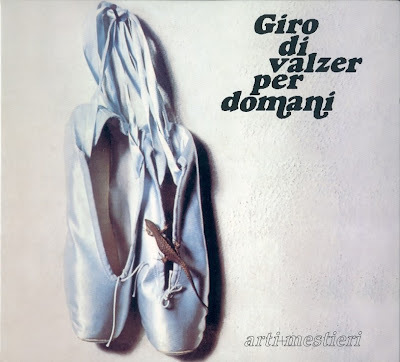 On the second album, 1975's Giro di valzer per domani, a singer was added, Gianfranco Gaza from Procession, and the album has a much better sound and production than the previous one, in a similar style as the previous one but with stronger jazz rock influences. Two of the album's best cuts, the instrumental Valzer per domani and the vocal Saper sentire were also released as a single. In 1979 another Arti & Mestieri album was released, Quinto stato, always led by Chirico but with a different line-up and more in a mainstream jazz-rock vein, while subsequent releases strongly veered towards fusion. Fourth album, Acquario, is not a live album as declared on the front cover, just a live-in-studio recording. Like its follower, Children's blues, it was released on a small label with local distribution only. Guitarist Venegoni also released two solo albums on Cramps as Venegoni & Co., always in the same jazz-rock style as later Arti & Mestieri. Drummer Furio Chirico has continued playing and teaching his instrument, also releasing solo albums and some drum playing tutorials. He's the first italian drummer ever playing at the Modern Drummer Festival in USA (2002 edition). Keyboardist Crovella has played and taken production role on new prog bands' albums such as Romantic Warriors, Tower, Mosaic. A revived Arti & Mestieri with original members Venegoni, Crovella, Gallesi and Chirico aided by Marco Cimino (from Errata Corrige, he had already joined the band on Quinto Stato, both he and Gallesi were also in Esagono) and violinist Corrado Trabuio released a new CD Murales in 2001 on the small Electromantic label. Mostly instrumental and somehow influenced by jazz and world music, the CD also includes reworkings of a couple of tracks from the early albums, Gravità 9,81 and Nove lune prima. Summer 2003 has seen the group playing with a new line-up with expanded vocal capabilities, Arti & Mestieri appeared at ProgDay 2003, in North Carolina, at the end of August. Founder members Furio Chirico and Beppe Crovella are now helped by Corrado Trabuio (violin, vocals), Slep (guitar, vocals) and Roberto Cassetta (bass, vocals), and they have a powerful live show entirely based on their 1974-75 albums... a welcome return! In 2005 another new studio work, called Estrazioni, and strongly connected with the earlier productions starting with its cover design. The record includes some tracks composed for a never released third album in 1977 along with more recent compositions, and is on a varied level but very promising indeed. The new line-up includes Marco Roagna (guitar) replacing Slep, and Alfredo Ponissi (sax), along with a guest appearance by the original guitarist Gigi Venegoni. The band is augmented in concert by guests Warren Dale on sax and flute and singer Iano Nicolò, frontman of the group Cantina Sociale, from Piedmont. * Bonus tracks not on original lp.